BERRIEN SPRINGS, MI–The Mustangs entered the contest at an even 3-3-1 heading into Friday’s afternoon matchup with Andrews University. A win would put the Mustangs above the (.500) mark for the first time in program history. The Cardinals from Andrews University welcomed the Mustangs to the west side of the state with a 0-2-2 record on the season. The host Cardinals, still seeking their first win of the season, hoped to upset the stronger Mustang squad. A strong start from the Mustangs would decrease any chances of a Cardinal upset. Ashley Inglsbee schooled the Cardinals defense for two goals, while Amber Williamson and Nicole Mabee chipped in a goal apiece. 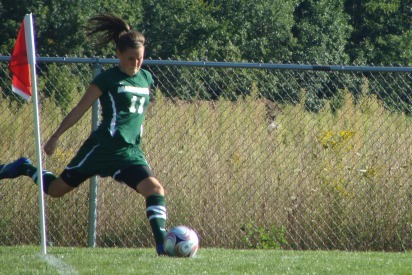 Mabee’s goal was scored in only her second game back from an injury. Assists were credited to Amber Williamson and Janina Velasco en route to a sound (4-1) defeat of the Cardinals. GAME NOTES: Freshman goalkeeper Shana DeVoe narrowly escaped with her fifth shutout of the season. The Mustangs played the latter part of the second half shorthanded due to a few minor injuries. The Mustangs return home for a Wednesday afternoon matchup against Concordia University. The Mustangs previously defeated Concordia on the road, 1-0. Game time is set for 4pm at Pebble Creek Park in Southfield.